I was asked recently about painting tropical scenes and how this differed from my usual British landscapes. Although I haven’t done any tropical work for a while, over the years I’ve painted quite a number of scenes in the tropics, especially in East Africa with its wide range of spectacular scenery. Desert scenery is one of my favourite genres, as the figures and colours can be quite exotic, and one tends not to find the painting water freezing up, as in more northerly climes. Unfortunately I don’t have any record of earlier jungle and tropical plant scenery paintings, so this is the closest I can find, until I manage to paint further tropical scenes, which probably won’t happen until next winter. 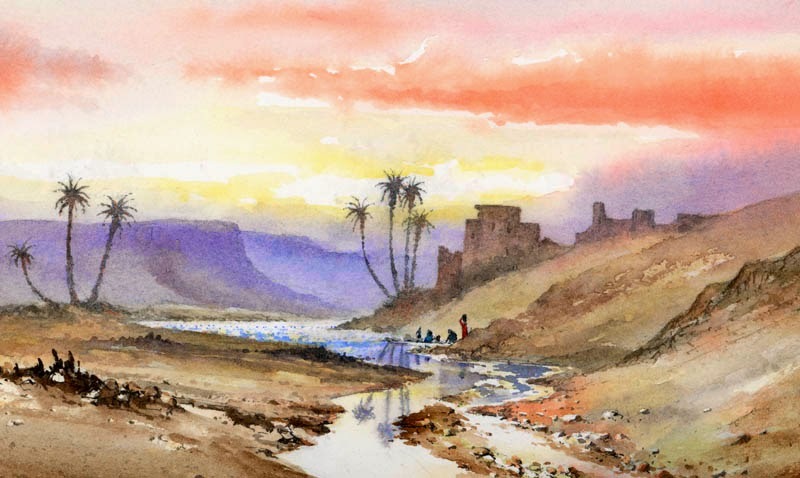 This watercolour shows a wadi in the Atlas Mountains of Morocco towards evening, with women washing clothes in the river. We were returning from an expedition when I spotted this marvellous composition, and did a quick pencil sketch of it, even though I felt pretty tired and was likely to be assailed by hundreds of kids demanding pencils. I take much the same colours with me to the hotter climates, as I do in Europe, but tend to use more of the brighter colours. This watercolour was done on Saunders Waterford 140lb hot-pressed paper which is excellent for bringing out the vitality of the brighter colours, really making them sing. I used vermilion in the sky, with gamboge in the brighter parts. As with most landscape work it helps to suggest space and distance with cooler colours in the more distant passages, and this can also throw the emphasis on to those areas of brighter colours, whether lush vegetation or other features. Here I used French ultramarine for the background. You can create really striking colour effects by juxtaposing complementary colours, for example bright red flowers or plants set in vivid green foliage. I hope these tips will help those of you who like more exotic scenery………..until I can get back into the jungle. It’s always nice to know your books are appreciated and the heartening news is that my Complete Guide to Watercolour Painting has been awarded the distinction of ‘one of the best How-to books of the year’ by the US Library Journal in New York. This, I believe covers all sorts of how-to books, not just art, so it is really pleasing that it has been recognised in this way. 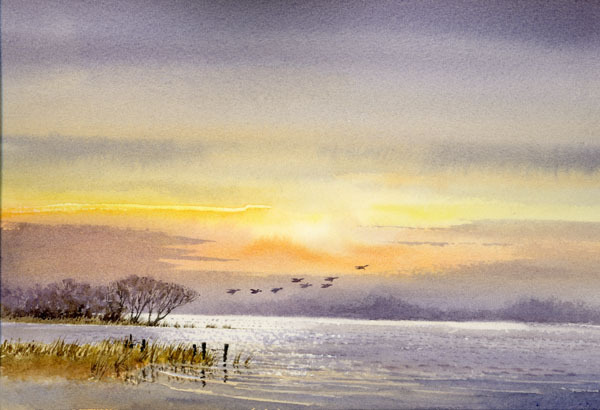 This watercolour, Norfolk Wetlands, is featured in the book, and looking at it I can still hear the water lapping against the shoreline and the sheer peace and tranquillity. Notice how although the main emphasis of detail is on the left-hand side it still works as a composition. Sometimes it’s good to break the rules and try for something a little different. I’ve placed the birds leading away from the focal point (the trees), and also highlighted the focal point with strong tonal contrasts. If you want to emphasise tranquillity then keeping your composition mainly horizontal will help enormously. Avoid to many strong verticals.